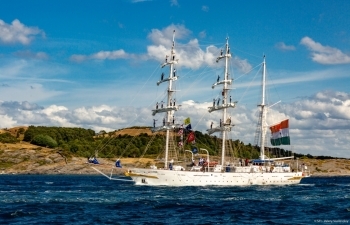 Embassy of India, Rome, Italy : News - 14-17 September 2018: Indian Naval Ship "INS TARANGINI" visits Palermo. 14-17 September 2018: Indian Naval Ship "INS TARANGINI" visits Palermo. years, INS Tarangini again will be in this famous port. 1997. The name Tarangini is derived from the Hindi word ‘Tarang’ meaning waves, thus Tarangini means ‘the one that rides the waves’. The ship is a ‘three-masted Barque’ signifying that she is square rigged on fore and mainmast and fore and aft rigged on Mizzen mast. The ship has excellent endurance and can remain at sea continuously for a period of over 20 days. She has a complement of eight officers and thirty eight sailors as permanent crew and can accommodate and impart sail training to 30 cadets. The primary role of the ship is to foster time honoured virtues of courage, camaraderie and endurance in officer cadets embarking on a naval career. She provides an ideal setting for first-hand experience of the natural elements by imparting training which includes sailing, setting and furling of sails, watch-keeping and sail manoeuvres. The ‘Tall Ship’ community believes that training onboard these ships is the best method of instilling among the trainees the indefinable ‘sea-sense’ and respect for elements of nature which are inseparable from safe and successful seafaring. The ship, in her 21st year of commissioned service set sail from Kochi on 10 April 2018 for seven month long voyage named Lokayan-18. During this deployment, the ship is scheduled to visit 15 ports across 13 countries. Till now, the ship has participated in ‘Tall Ships Races 2018’ from UK to Denmark and Norway to Netherlands. The ship has been making headlines in all port calls with her motivated crew. The ship was awarded for ‘Grandest Entry’ into the port and for ‘Traversing the Farthest’ at Bordeaux, France. The ship’s contingent stood ‘First in Crew Parade’ and was also adjudged ‘Best Dressed’ at Stavanger, Norway. During her return Voyage to base port Kochi, the ship will visit Cadiz on 03 Sep 18. The visit to Palermo will be INS Tarangini’s 13th Port Call. As India-Italy celebrate 70 years of diplomatic relations in 2018, this visit is another symbol of our enduring multi-faceted ties. Embassy of India in Rome following Gandhiji's teachings on sustainable use of resources and minimal damage to the environment by planting trees at Embassy Residence. BHEL Electronics division, Bangalore has invited offer from reputed companies for supply of following materials as per the attached tender documents.